We, 52 women and men from 18 countries – Bangladesh, Burma, Cambodia, China and Hongkong SAR, India, Indonesia, Kyrgyzstan, Lebanon, Mexico, Pakistan, Philippines, Sri Lanka, South Korea, Spain, Thailand, Timor Leste, USA, and Vietnam – and representing peasants, agricultural workers, fisherfolk, indigenous peoples, workers, women, youth and students, refugees and stateless persons, academia, environmental and support NGOs and networks met for the ‘Promoting a Transformative Agenda for Sustainable Development: A Strategy Workshop on Rio+20’ on August 15-17, 2011 in Bangkok, Thailand. We have come to this meeting fully aware that twenty years after the UN Conference on the Environment and Development in Rio de Janeiro, popularly known as the Earth Summit, the world is farther than ever from reaching the goals of genuine people-centered sustainable development. The multi-faceted, yet interconnected crises encompassing the economic, political and ecological spheres are causing unparalleled suffering all over the world. Worst afflicted are people from poor countries, most especially women and indigenous peoples. This crisis of global capitalism further propels profit-driven and unsustainable development that causes irreversible damage to the world’s environment. This crisis results in the global climate meltdown, the appropriation of natural resources and the destruction of lives and livelihoods, especially of ecologically-sensitive indigenous and traditional livelihood systems. Rio+20 in 2012 thus comes at an opportune time, when the world’s governments and peoples are obliged to think of alternatives to the current development model with its ever-increasing failures. It presents opportunities to push urgently and comprehensively the agenda for genuine people-centered sustainable development. Indeed, solutions exist. And they are in our hands, the people, who in our communities, workplaces, farms and forests, make the building blocks of genuine people-centered sustainable development. As we strengthen and consolidate our movements to achieve genuine economic, political, social, gender, ecological and climate justice, we call on the leaders of governments, multilateral institutions and other stakeholders to heed the people’s calls for genuine sustainable development. We urge governments and the UN system to deliver and not backtrack on the promises and commitments made in Rio twenty years ago. We are alarmed at the corporatization of the Green Economy agenda. We believe that technological fixes and market-based incentives are false solutions to the ecological and climate crises and will not advance sustainable development. For sustainable economies to develop, it is crucial to democratize ownership, control and decision-making over productive resources and assets. We should move from a capital investment model towards an appropriate mix of more democratic modes such as cooperative, community-based and driven, commons or public forms of ownership to ensure that economic activity provides sustainable livelihoods and meets the developmental goals of the community and society. Public enterprises should remain in public control and privatization should be reversed. Promote sufficiency-based economies (i.e. catering primarily towards meeting local needs and demands, developing local capacities, based on available resources, appropriate technologies and resource sharing). Manufacturing should promote closed-loop production where products are designed with minimum use of energy and materials, longer life-spans and with maximum reuse and recycling of parts and components. Promote mass public transportation systems. Implement genuine agrarian, aquatic, pastureland and forestry reforms; and promote biodiverse ecological agriculture that benefit small producers, especially women and indigenous people. Respect and promote community-based and farmer-driven efforts in organic agriculture, seedbanking and on-farm improvement of crop varieties and animal breeds. People-centred sustainable economies should promote the rights of indigenous peoples and local communities in accordance with UNDRIP including rights to land and resources, and free, prior and informed consent (FPIC). To deliver on the promises of the first Earth Summit, there is a need for an effective and democratic institutional framework that can and will ensure economic progress, social equity and environmental protection – the three pillars of sustainable development -- in an integrated and holistic manner. This governance architecture must operationalize and implement the Rio principles including the Right to Development, common but differentiated responsibility, the polluter pays principle and the precautionary principle. Rio+20 should work for the immediate establishment of a broad inclusive multi-stakeholder consultative body or network tasked with supporting the promotion and implementation of Agenda 21 and Rio+20 resolutions. Such body should be participatory, democratic, and have an integral multi-stakeholder character that accords civil society with equal rights and equal voice as governments. The UNCSD 2012 must affirm and strengthen internationally-agreed principles and objectives for sustainable development at all levels of government. All actors should be held accountable to well-established international standards and conventions – e.g. Right to Development, Human Rights conventions, Extractive Industry Accountability, Transparency Accountability Initiative, etc. Enhance development cooperation in support of sustainable development. Commitments from the North in the form of adequate financing (according to common but differentiated responsibility), appropriate technology cooperation, and needs-based capacity building are of utmost importance to support developing countries make a just transition to sustainable development pathways. Uphold food sovereignty to address the food crisis. Communities should have the right to determine their patterns of food production and consumption, and famers should be able to prioritize food production for domestic consumption. 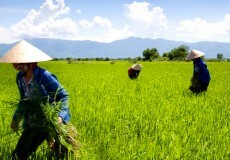 Government should give incentives to sustainable food production practices. There should be a global mechanism to assess the impacts of new technologies. Such mechanism should provide resources towards building capacity of countries and communities to assess and monitor the health, biodiversity and environmental impacts of new technologies. We support the adoption of an International Convention for the Evaluation of New Technologies (ICENT) and an outright ban on technologies that put the planet at grave risks such as geo-engineering. Policies should respect cultural diversity, and modern science should be combined with indigenous knowledge in bottom-up approaches of research and development to develop technologies that are appropriate and democratic. Today, even more so than twenty years ago, people of the world are aware that the challenge of genuine sustainable development requires no less than the profound transformation of societies and of international relations. We must all rise up to the challenge.